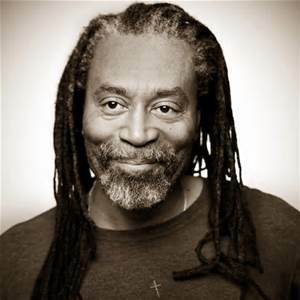 Although I remember well his best known song, I hadn’t remembered that Bobby McFerrin was the one who sang “Don’t Worry, Be Happy.” That song topped the Billboard Hot 100 charts on Sept. 24 and Oct. 1 in 1988, twenty-five years ago now. It was the first a cappella song to ever reach number one. Then in February 1989 it also garnered the Grammy Award for Song of the Year. The lyrics for McFerrin’s lilting song seem to have been inspired by Meher Baba, whose picture with the words “Don’t Worry, Be Happy” appeared on numerous posters and inspirational cards. Baba, whose birth name was Merwan S. Irani, was a “spiritual master” from India, who claimed to be an Avatar, God in human form. So with his hit song McFerrin (b. 1950) made Baba’s simple words known around the world. People greatly enjoyed both the music and the appeal of the lyrics. George H. W. Bush even used McFerrin’s popular song in his 1988 U.S. presidential campaign—until he had to stop doing so because of McFerrin’s objection. One of my good friends always includes the words “Be well and feel good” before his name at the end of his email messages. That is a nice wish, but we don’t always have control over whether or not we are well, nor completely over how we feel. But I assume my friend David also likes the words “Don’t worry, be happy.” And we can have considerable control over worry and some over whether or not we are happy. Long ago I heard it said that we humans worry about two things: things we can change and things we can’t change. If we can change something we don’t like, we should get busy and do it rather than just worrying about it. And if we can’t do anything about it, there is no use to worry. And then I remember these words attributed to Abraham Lincoln: “Most people are about as happy as they make up their minds to be.” Just last week I saw an article on “The Habits of Supremely Happy People.” The author of that piece cited psychologist Martin Seligman, who stresses that at least 40% of our happiness is up to us. So perhaps to a large degree we can be happy and not worry, if we so choose. McFerrin wrote those lyrics as a tribute to his mother, but it is a good reminder that God can (and probably should) be pictured as Mother as well as Father. There are several YouTube videos of McFerrin’s “Psalm 23,” and I particularly enjoyed this one (click here), which includes a tribute to famous women throughout history. Earlier this year McFerrin released a new album, “spirityouall,” and he talks about it in an interesting interview on the May 24 Religion & Ethics Newsweekly program (found here). Perhaps McFerrin can sing about being happy and not worrying because of his deep faith, such as he expressed in “Psalm 23” and in his new album.